In December this year, world governments will meet in Paris to agree a new binding treaty to halt and ultimately reserve global climate change. COP21 is one of the most important environmental conferences ever to be held, but also one of the most important human rights gatherings of the past half-century. The ability of States to reach – or not – a new and ambitious global agreement in Paris will have a determinative impact on the lives, prospects, hopes, dignity and rights of millions of people around the world. It will also have profound consequences for population movements, with more frequent and powerful disasters (slow and rapid-onset) causing more and more people to be displaced either within countries or across international borders. The scale of these potential challenges for humanity and the planet, and thus the scale of the responsibility on the shoulders of world leaders and the wider international community, is brought into stark relief by a new policy report from the Universal Rights Group think tank. The consequences of climate change for the enjoyment of human rights have been considered and recognised by the UN on many occasions. Both the Human Rights Council and the Conference of the Parties to the UNFCCC (COP) have recognised that climate change impacts, such as rising sea levels and more frequent and severe extreme weather events, undermine a range of internationally-protected human rights – from the rights to water and sanitation, to food, to health, to adequate housing, and even to life. What is more, both bodies have acknowledged that these consequences are felt most acutely by individuals in already vulnerable situations, such as young children, the elderly, and persons in extreme poverty. This, in turn, raises concerns about equality and non-discrimination, and highlights the issue of ‘climate injustice’ – that those suffering most due to climate change have contributed least to the problem. 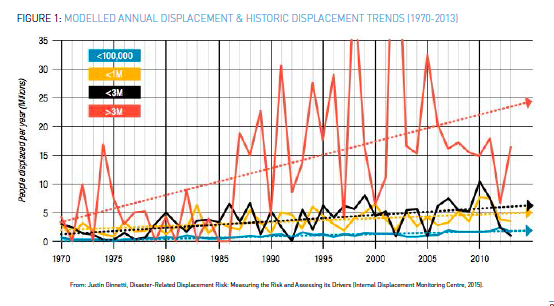 The human rights implications of climate change are particularly striking in the case of displacement. Global warming is anticipated to lead to more frequent and severe natural disasters, and in some cases its impacts may render certain parts of the world uninhabitable. Some people will seek to migrate before conditions deteriorate, while others will be displaced by sudden-onset disasters (e.g. cyclones) or slower- onset processes (e.g. drought). 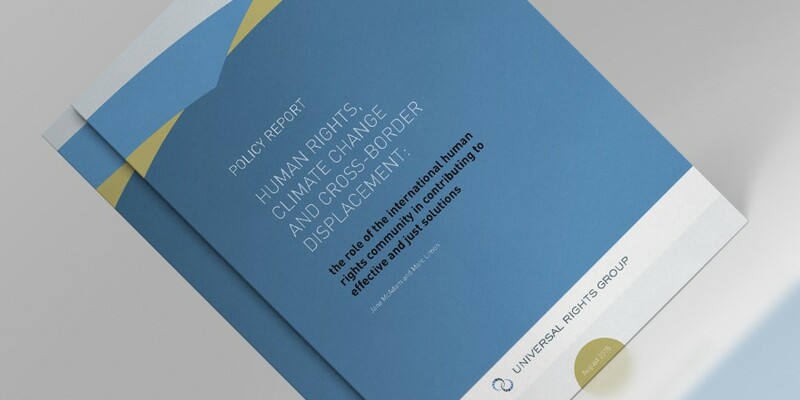 Even if one focuses on just one of these scenarios – displacement in the event of sudden-onset disasters – the scale of the (actual and potential) human rights challenges are enormous. 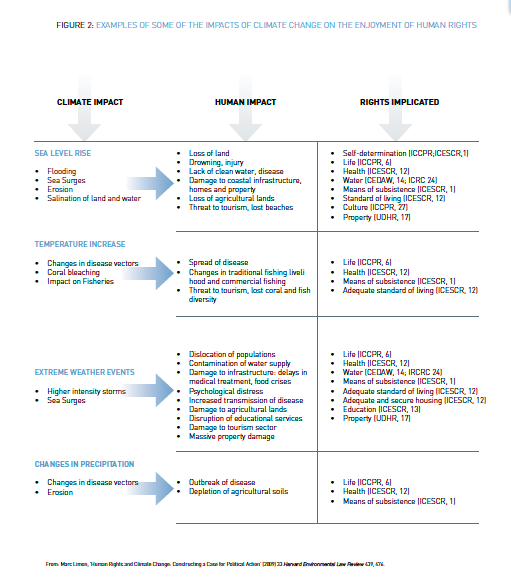 Major extreme weather events have already resulted in significant displacement, and the increased frequency and magnitude of such events in the context of climate change will amplify the challenges and risks associated with it. According to estimates, between 2008 and 2012, sudden-onset disasters displaced an estimated 144 million people. In 2013, almost three times as many people were newly displaced by disasters than by conflict. Some 22 million people were displaced in at least 119 countries, mostly by rapid-onset weather-related disasters. The vast majority of such displacement, 97% between 2008 and 2013, occurred in the developing world (almost 81% in Asia). It is harder to quantify the number of people displaced by the slower-onset impacts of climate change. Nevertheless, national and local case studies give a sense of the possible scale of the phenomenon and, by extension, the human rights implications. For example, in 2011 some 1.3 million people were internally displaced in the context of drought and instability in the Horn of Africa especially in Somalia. While the vast majority of people displaced in the context of disasters will remain within their own country, some may seek protection in another country. For example, during the above-mentioned drought in the Horn of Africa, over 290,000 people crossed an international border in search of assistance. Looking ahead to COP21, URG’s new Policy Report makes a number of recommendations to international policymakers, covering: the necessary ambition of a new climate deal; the need to integrate human rights obligations and principles into its architecture; the need for governments to stop working in silos and recognise the multi-dimensional consequences of global warming for people, for displacement and for the planet; and the importance of leveraging the UN human rights mechanisms to press for effective, responsive and just climate change solutions. For interviews or for more information, please contact Marc Limon on +41 22 755 14 56 or at marc@universal-rights.org.